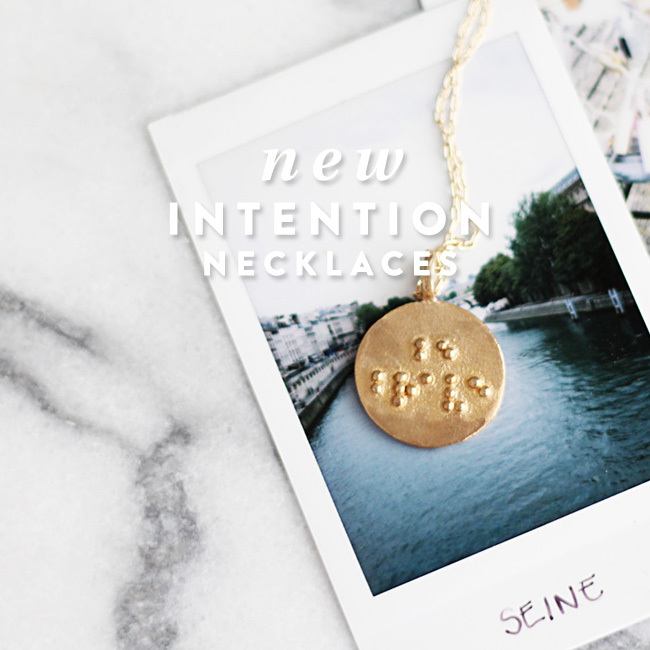 Today I’m sharing my brand new Intention Setting Mini Series I’ve been working on for you over the past few weeks! The free three part video series will be launching with the first video on Thursday, but you can sign up to get access to the mini series here (please note: if you are on my email list you do still need to sign up in order to access the course). The mini series will only be available for a short time, so you’ll want to sign up for free now. Plus, I’m also sharing the key habits and changes I recommend trying to design your life around your intentions in each area of your life from closet to career. Email readers: I’m so sorry about the link mishap on today’s email. Click here to go to the right post! Today is the day before my 30th birthday(! 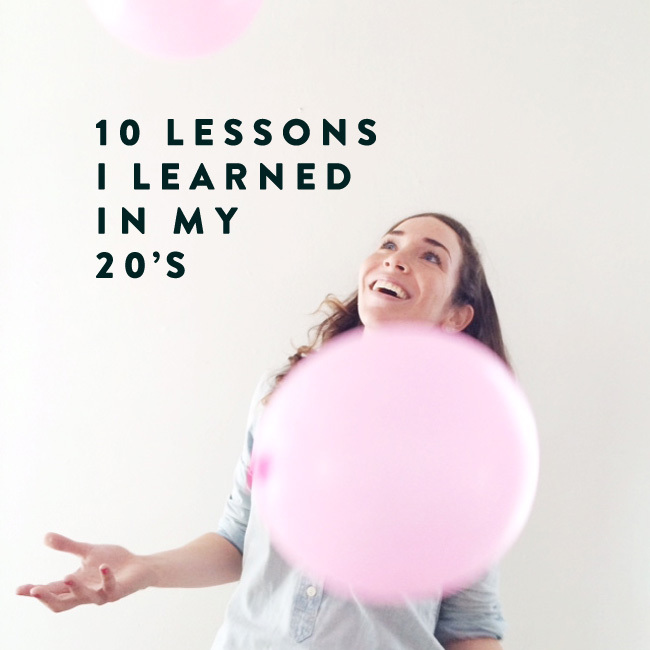 ), so I thought it would be fun to reflect on the 10 biggest lessons I learned in my 20’s. And since last week’s “Mini Edition” of The Lively Show was such a big hit… I decided to share the lessons I’ve learned with you via another Mini Edition of The Lively Show! I’m sharing the lessons I’ve learned concerning marriage, business, uncertainty, and cultivating a beautiful home. Today’s Lively Show episode is the perfect blend of deep introspection, inspiration, practical how-to, and fun! 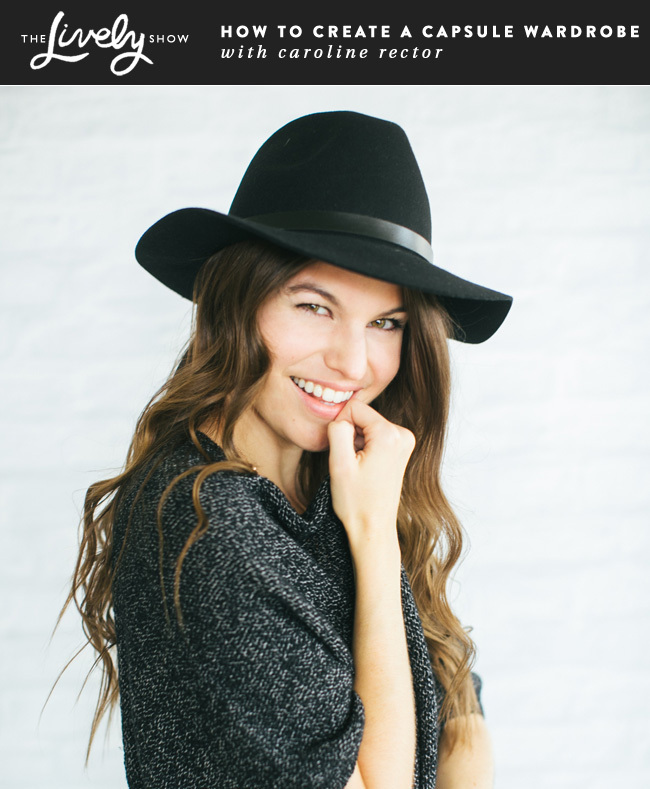 I’m talking with Caroline Rector of the minimalist fashion blog, Unfancy. Caroline’s blog focuses on creating a “capsule wardrobe,” which – for her – means wearing the same 37 pieces (including shoes!) for three months at a time. I knew I had to have her on the show to share the journey that brought her to the concept… and share her insights for those of us who would like to attempt a similar experiment in our own wardrobes. This show is perfect for anyone interested in trying a creative wardrobe framework, simplifying, discovering their true style, or tackling difficult shopping issues. 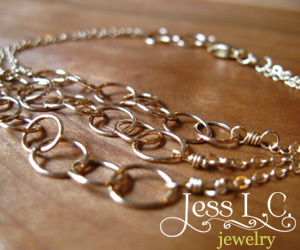 Over the past few months, I’ve been working with Nichole of Acanthus Jewelry to bring back the most popular Jess LC collection of all time: the braille intention necklaces! 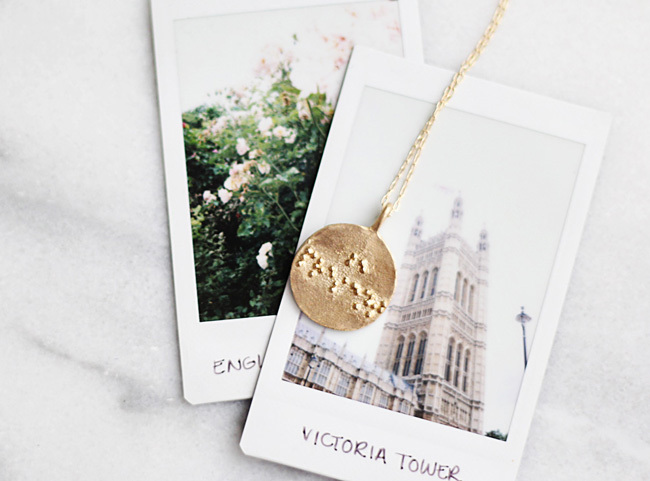 We are so proud to bring these to you – each necklace acts as a subtle reminder to Be Brave or Be Present throughout your day. Simply rub the braille throughout your day to connect to your Values-based intention. 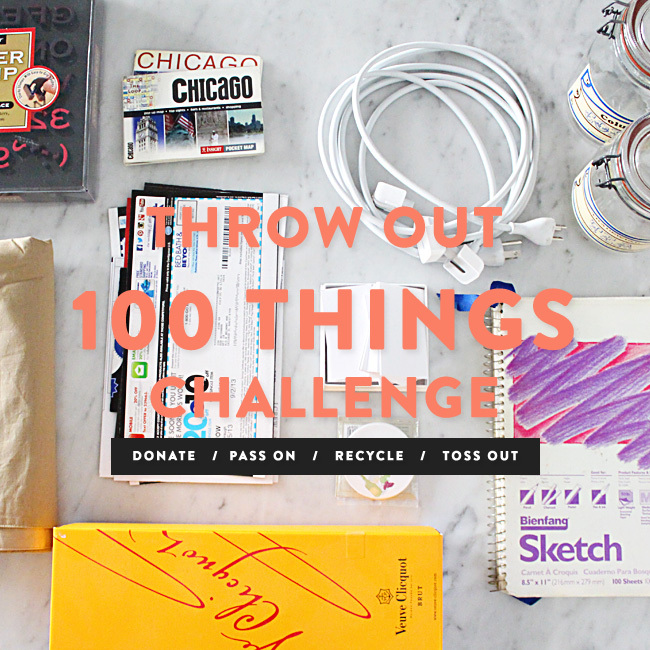 I have three very exciting new things to tell you about! 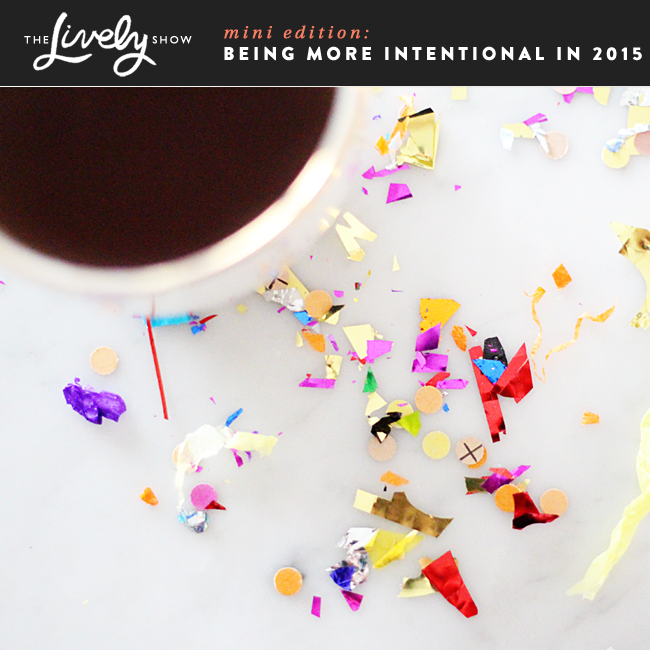 Today I have a fun girl chat with Liz of Sequins and Stripes on The Lively Show. 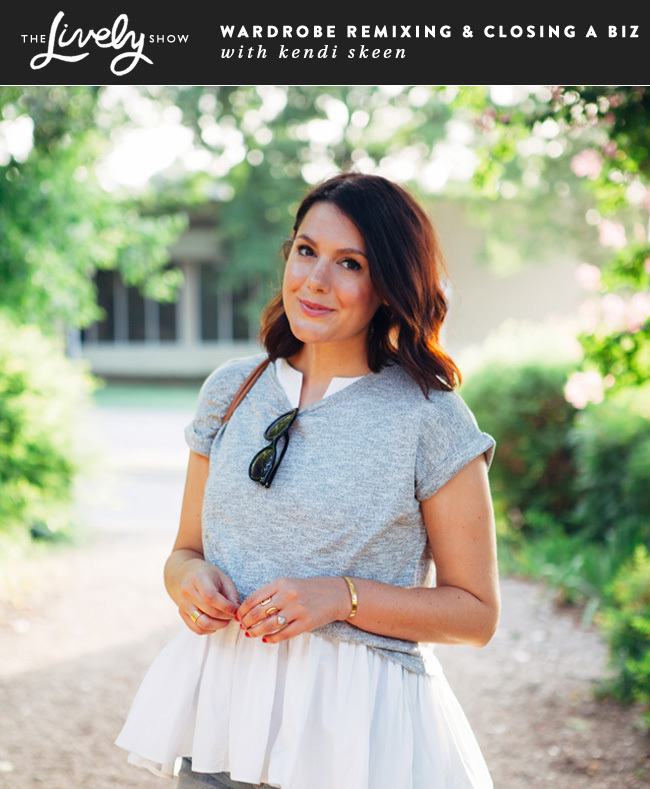 Liz is a (successful) blogger, stylist, soon-to-be bride, and overall adorable person! I’ve personally been friends with her (as well as a follower of her blog) for several years now. In fact, her taste has been a huge inspiration for my own style. In the show, we talk about defining your style, the progression of Liz’s life and career from corporate to blogging and styling full-time, and there is a hefty dose of strategy advice when it comes to making an income through blogging. So anyone looking to learn more about making money via blogging sponsorships and brand collaborations will love this episode! The two “unsuccessful” blogs Liz started before Sequins and Stripes. How she landed her first styling clients before S&S. How to comb through your closet and determine which things to exfoliate. A few little details about Liz’s upcoming wedding(!). How List transitioned financially from her full-time job to her styling business. Liz’s biggest struggle in her business right now. What Liz would say to someone just starting out. PS – I’m being interviewed on a Podcast, too! I’m over at the With Purpose Podcast talking about living intentionally, my take on purpose, how my parents influenced my career, and more. PPS – Want to ditch the stress, “shoulds,”, and future tripping? As someone who has read countless books on living an intentional life, Jess has found the secret to bridging theory into actionable items today! This class will benefit anyone seeking greater meaning in your life, from anywhere. To show my gratitude for your support throughout 2013, I have five gifts planned for you over the next five days! There are no outside sponsors or companies associated with these gifts. They are simply from me, to you. Guys, this week has been so much fun! I’ve kinda felt like an intentional Santa Claus giving out gifts everyday. It’s also a bit staggering to see all the mentorship applications, and workbook/PV Starter Kit downloads. 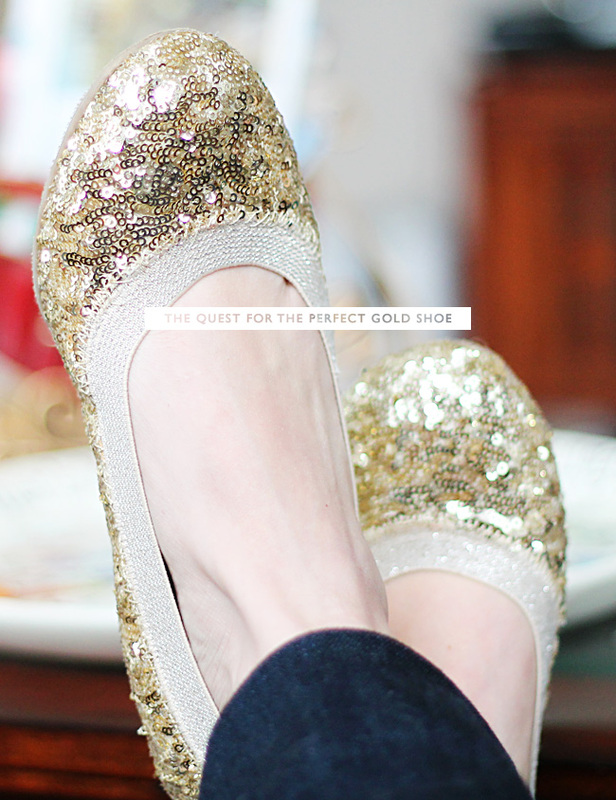 In honor of Wineday Friday, I am wrapping up the Week of Giving with a pair of gold flats! I cannot thank you guys enough for all of the comments and emails filled with gold shoe suggestions over the past few months. After looking at what seemed like hundreds of gold flat options, I finally settled on the original pair from J.Crew factory that I thought would be a half size too small. I took the plunge and purchased them despite the size and they ended up fitting perfectly! While I was doing this shoe size dance, Carrie of Dream Green DIY, snagged some 8.5 gold ballet flats at her super special local J.Crew outlet for me, too. I paid her back for the extra pair of gold shoes, but the 8.5’s are too loose for me. 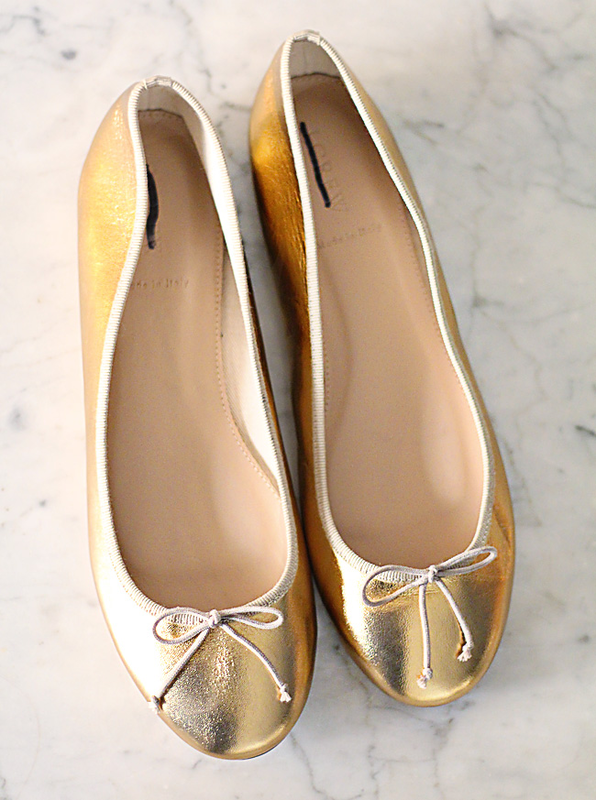 Which means I now have a pair of gold J.Crew ballet flats for you! If you want to snag these flats, check out the details below. And a huge thanks to you all for being a part of the 2013 Week of Giving! I have been so blessed by your support over the past year and I hope that the things I shared this week can help you take 2014 to the next level. And as always, thank you for reading and have a great holiday week/weekend! 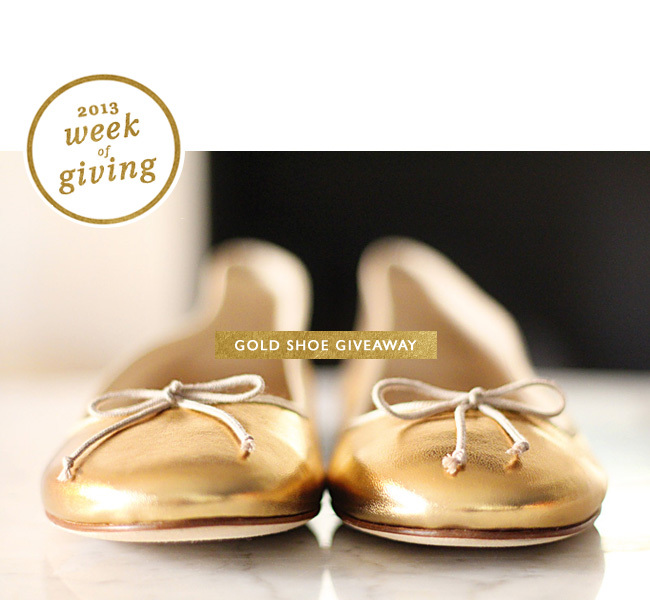 Please leave a comment on this post to win the gold shoes! Entries will close December 27th, and the winner will be selected on December 30th. Remember, these are a size 8.5. Guys, today’s Wineday Friday is pretty serious. Last week while Mr. Lively and I were visiting Boston we walked around in the rain for several hours and my lovely and comfortable Target sequin flats shown above were ruined. They were in such bad shape that they didn’t ever dry out properly and they got trashed before we flew home. I am super sad about this because these puppies are were my go-to shoe 80% of the time and I’m having a hard time finding another pair to replace them. I spotted a more expensive glitter pair at J.Crew, but I’m not thrilled at prospect of paying 400% more than I paid for the Target shoes when they have glitter and may not even turn out to be as comfy as the cheap pair. I also noticed a leather ballet flat option on the J.Crew Factory site which I liked – but my size is sold out (8.5). I’ve done searches on Target (I’m not a fan of their updated gem-y version of these shoes), Piperlime, and Pinterest to no avail. 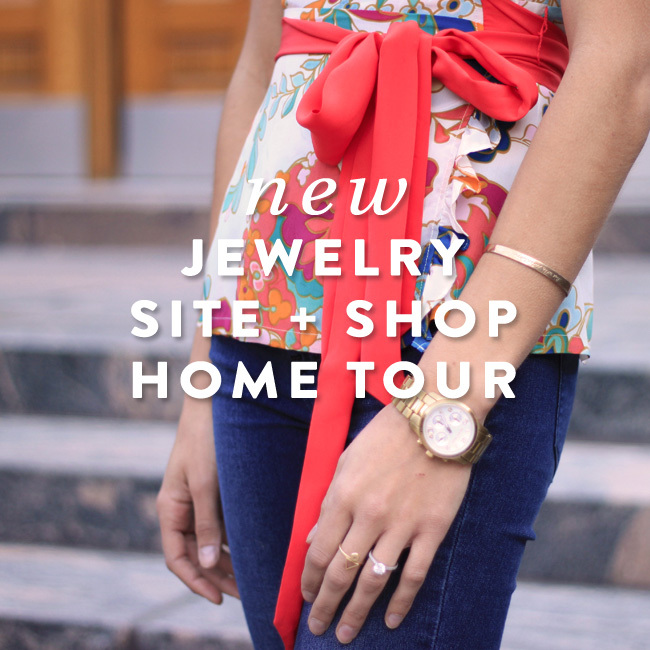 I can’t seem to find the perfect flat gold show for fall and winter. Does anyone out there have any suggestions for me? I’m all ears! Thank you so much for reading. I hope you have a great weekend! PS – I’d like to thank Blair for helping me re-design the new sidebar. Site update #47,324 is now complete! This fall I’ve been pretty careful with my clothing purchases in order to stay on track with our savings goals. Thanks to awesome sales, store gift cards, and a handful of J.Crew Factory coupons, I’ve been able to get six new pieces that are fun to mix into my regular wardrobe while staying on budget. 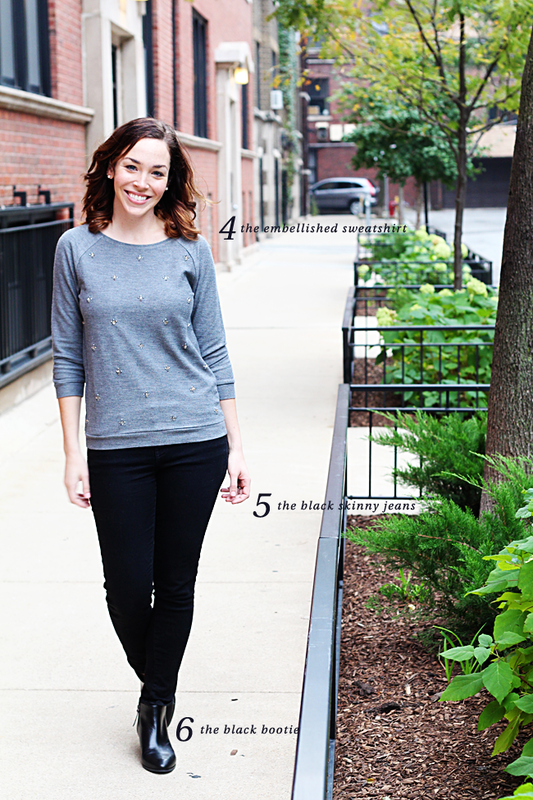 The first update is a fall classic: the cozy cream sweater. I got this waffle version at J.Crew Factory and will wear it into the winter as well. These next two items are my new fall favorites. 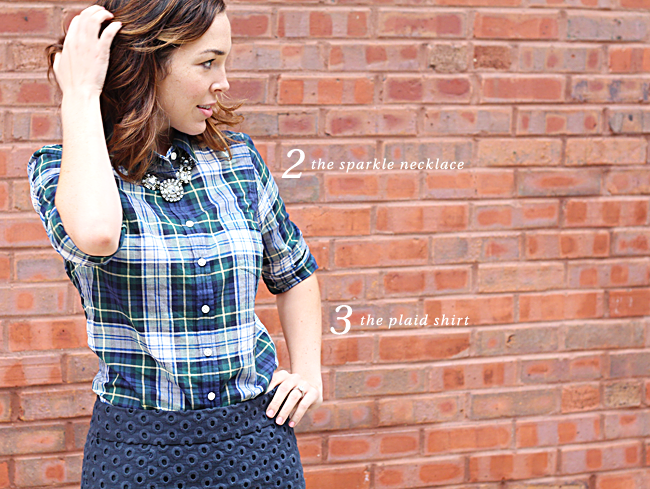 I’ve seen the sparkle necklace (similar) and button-down shirt look for a while and wanted to try it out. 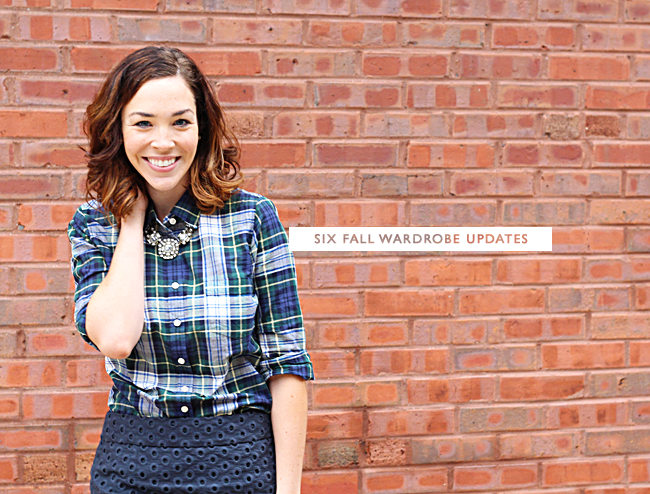 I love how the crystals make the masculine plaid a little more girly. To be honest, I wasn’t crazy about the embellished sweatshirt trend at first. But when I spotted this simple and less expensive version at Loft on sale, I decided to give it a try. Though I styled the sweatshirt here with the black skinnies, I think it will be even cuter paired with a skirt, black tights, and booties. As for the black skinnies, they are my new go-to pant. They instantly make any outfit look just a bit more polished. And then of course, there are the super comfortable black booties. Clean, simple, low heel, and great leather. As I mentioned on Monday, I am currently traveling around Boston and New Hampshire for a little belated birthday trip for Mr. Lively. 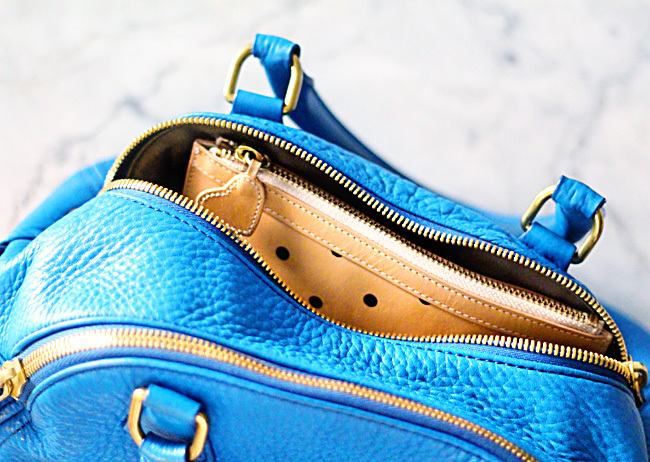 If you’re wondering what I packed for the long weekend, just take a look above! Though I don’t have many purses, I do like to match my purse to my outfit. 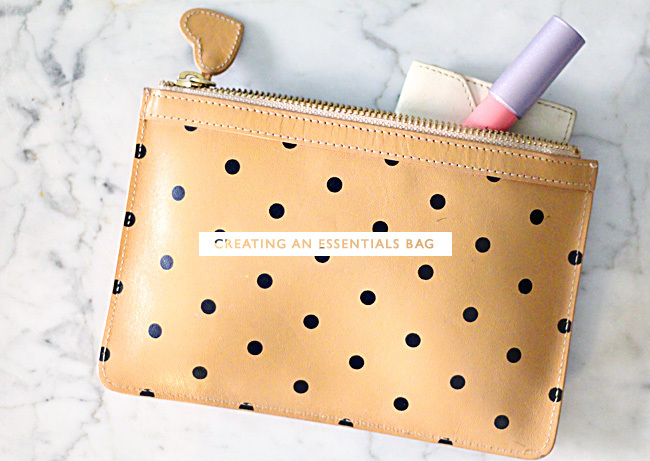 Due to this daily bag rotation, I have tried over the years to create an essentials bag that could corral the smaller items I use in one place. In theory, my essentials bags were always helpful. But I either stopped swapping them from bag to bag after about a week, or I would never even open the essentials bag to begin with, which rendered the whole concept useless. However, this past month I’ve finally successfully created an essentials bag that I actually use and continue to grab before I head out the door. Back in the day, I used to include everything under the sun – Tide sticks, sewing kits, bug spray, the kitchen sink, you name it. But really, I don’t ever use those things, and they just made the bag bulkier and less likely to fit in all of my purses. So if you consider making an essentials bag and use a Tide stick religiously, be sure to include one! But I don’t suggest adding a mini flashlight unless you find yourself stuck in the dark on a regular basis. 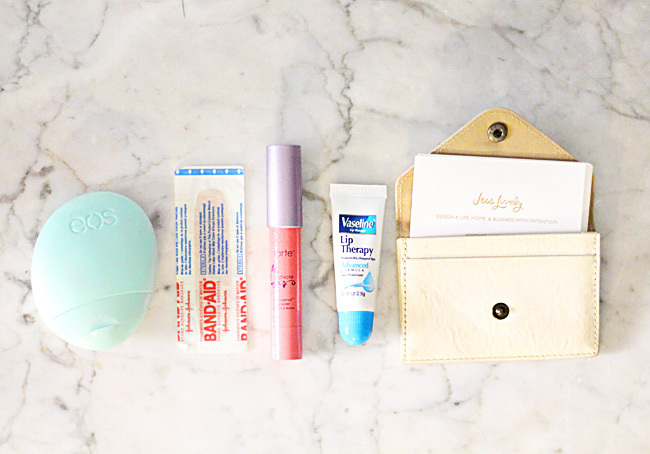 By literally paring back to these five essentials, I have exactly what I need and use daily. 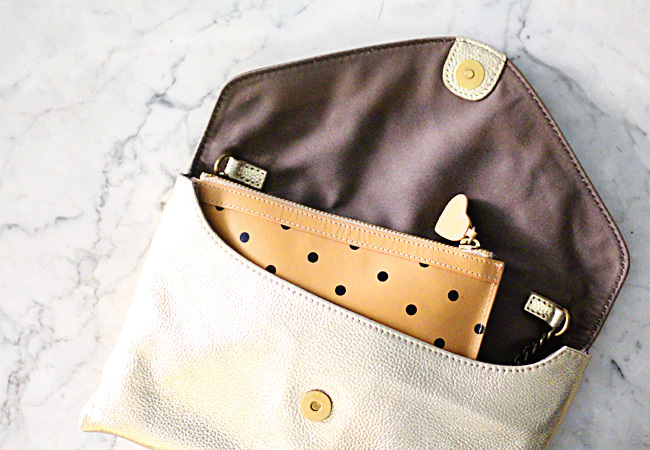 As far as the essentials bag itself, I am now using this little J.Crew pouch. In its past life it was a super-duper sized business card holder for Alt Summit. But really, I don’t need a huge business card caddy day-to-day. Instead, a smaller one from college works better and fits within the pouch. Now, when I need to head out the door, I just toss my sunglasses, keys, wallet, and essentials pouch into a purse and leave. Does anyone else have an essentials pouch? 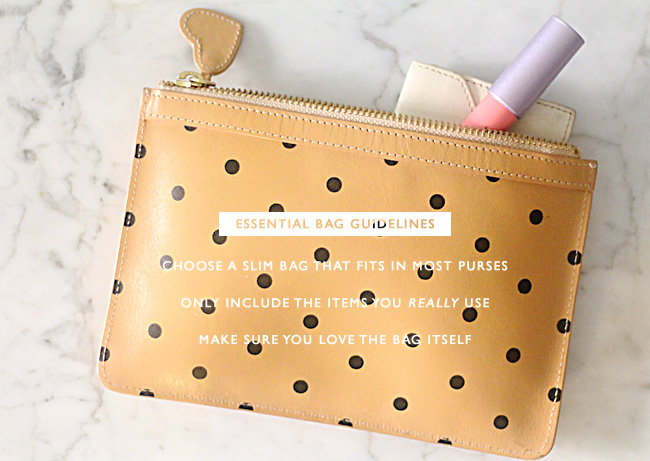 If so, did you have trouble finding the right mix of products and bag selection, too?